There is one more Summer Dress in my head, begging to be made. However, this one needed some thinking time before I could start it, to help me decipher the correct pattern (or patterns) to use. The fabric is pretty special, so I don’t want to make a mistake. What to do to fill up this time I was spending thinking? 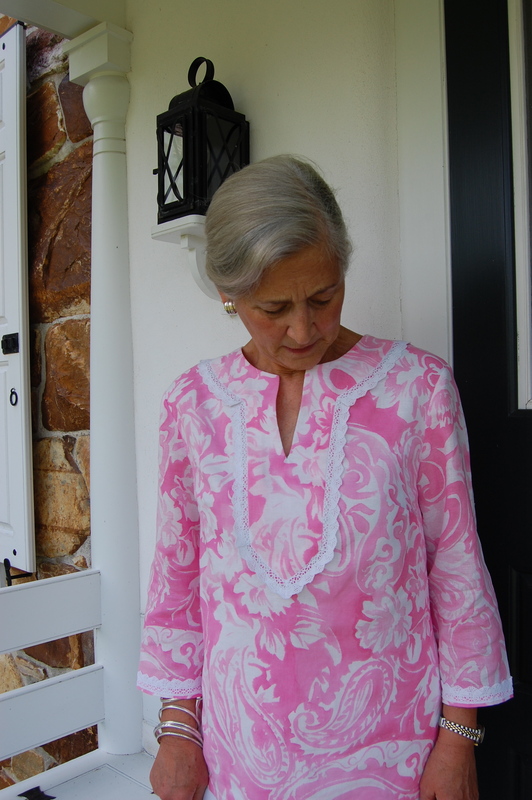 It seemed the perfect opportunity to do some really simple sewing, as in “Easy Tunic Top”. Last summer, while in JoAnn’s for one of my frequent thread or zipper trips, I stumbled onto some pretty linen/cotton blends – and on a whim, purchased two lengths. One I made up immediately into a tunic dress; the other one has just sat around, keeping company with other lengths of fabric folded neatly on my “linen” storage shelf. After finding (in an Etsy shop) this classic tunic top pattern, now out-of-print, I decided this might be a good time to use that second piece of “whim” fabric. No matching necessary on this “whim” fabric. I really did not want to go to the trouble to make a muslin, when I could look at the pattern and make a good guess as to its fit on me. 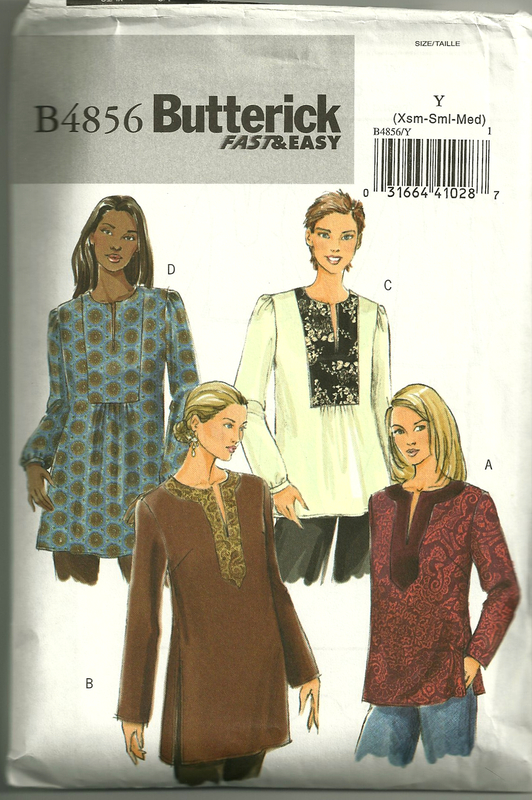 It is loose, as tunics are – so all I did in preparation was to transfer the lines and markings from the tissue pattern onto a sturdier pattern paper. I decided to line the body (not the sleeves) of the tunic, as the fabric is lightweight, and in the sunlight it could be “revealing”. I used a very lightweight rayon voile, which I get at Dharma Trading. I finished the seams with Hug Snug binding tape, which is just so easy to use and makes such a nice finish. The more I use it, the more I wonder how any dressmaker can live without it! This shows both the seams finished with Hug Snug and the white voile lining. Because I was making the front placket out of the same material as the rest of the top, I knew I would need to do something to differentiate it, so I used a nice, low-profile cotton lace around the edge. I decided to make the sleeves three-quarter length, which is my favorite sleeve length. At first I wasn’t going to put any lace on the edges of the sleeves, but then it just didn’t look quite right without anything, so I added it. 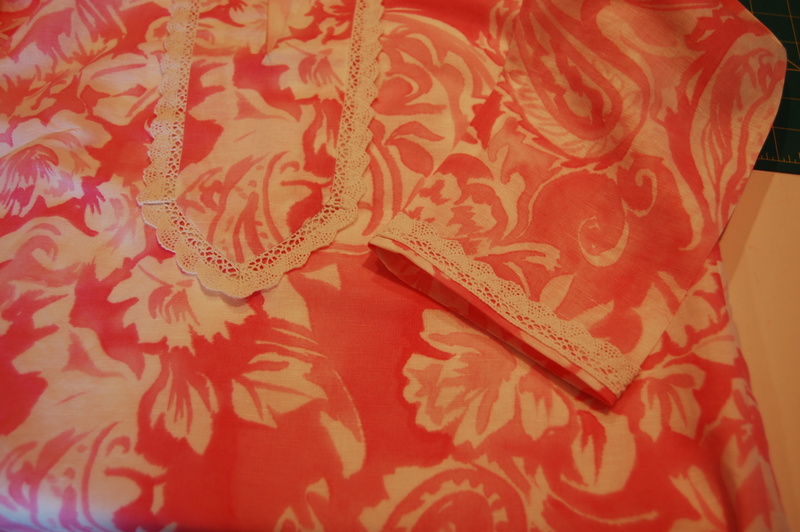 I attached the lace with the straight edge at the bottom of the sleeve, with a narrow margin of fabric showing. Very nice! I love tunic tops for summer (and beyond!) and the print is vibrant and pretty. Great job! Thank you! 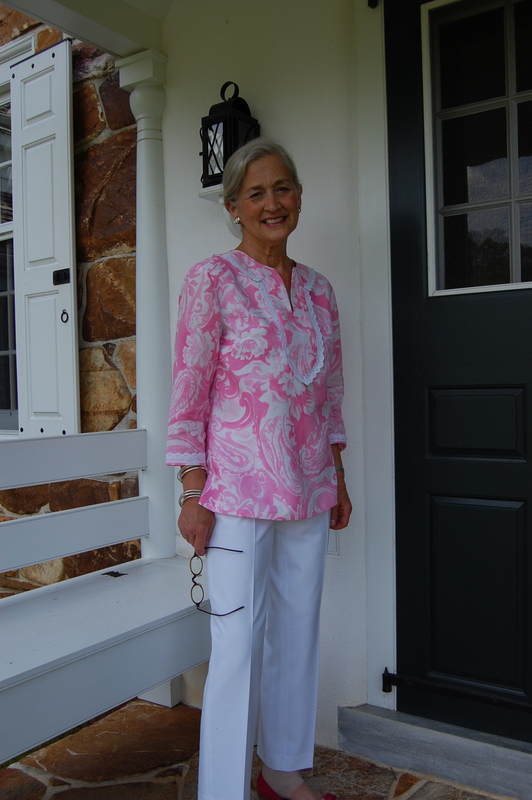 I agree that tunic tops are very easy-wearing summer attire! When I saw the fabric for the tunic I was surprised it was pink. The next project is Moygashel linen. It is the BEST. You are so right, Peggy! Another Moygashel linen is waiting in the wings here – and it is, indeed, the best! Beautiful top for summer weather! Thank you, Jackie! So nice to hear from you! Love the top! And looking forward to seeing the next project! I think the pink is lovely on you ! It looks so good with the summer white pants. I really like tis print !!! Thank you, Naomi. 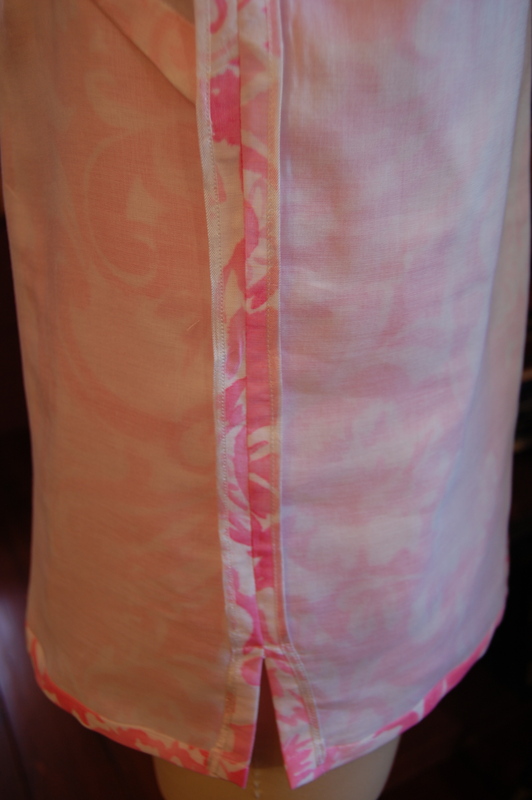 Pink is actually one of my favorite colors – so I am sure that is why I was attracted to this fabric! I agree with everyone else. The pink and white is a lovely femine look, and I love the way the lace enhances the paisley print. Wear more pink! Thanks so much for the “pink” endorsement! I love pink, and I think light pink, especially, is a color that is flattering to most people. Looks wonderful on you and so summery. 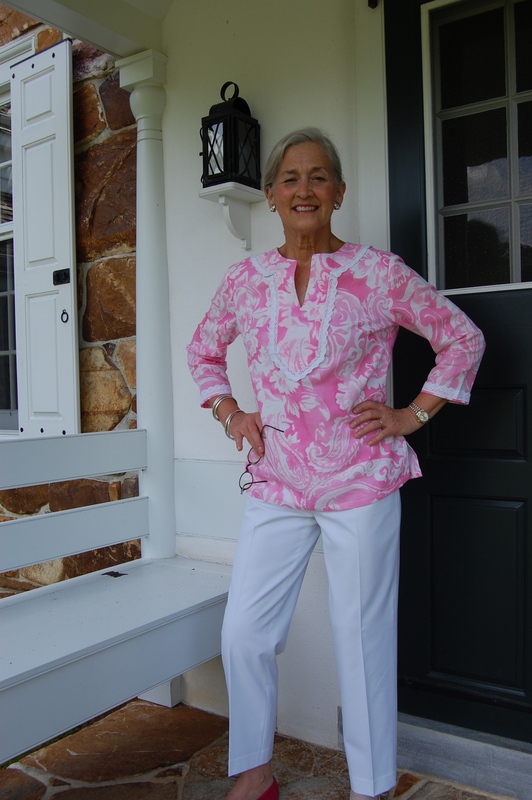 In have a tunic with 3/4 sleeves and it has an invisible zip along the left side from about 1 inch below the underarm to the high hip (the zip is closed at both ends). This allows for a closer fit yet retains the classic tunic shape; just a thought in case you decide to add darts for a slimmer fit. The photos look very attractive but I know that sometimes you want to tweak things.